The 6 metre band is showing signs of life, as this map of WSPR activity from this afternoon shows. However, some of the traces on the WSPR application screen look a bit odd. I don't claim to be an expert but I think what I am seeing is the result of doppler shift on the signals being reflected by fast-moving Sporadic-E clouds. In several cases what seems to be a trace has not been decoded. I've said this before, but I wonder if WSPR mode with its 110 second transmit periods and tiny frequency shift encoding is really suitable for detecting Sporadic-E propagation. But no-one has ever commented on this, leaving me to wonder whether they think I'm an idiot who doesn't know what he is talking about or whether nobody knows. 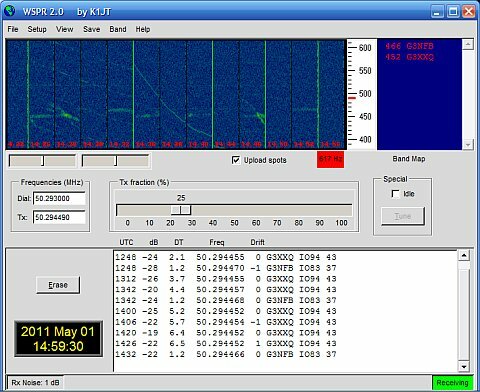 The digital mode most people seem to use on 6m is JT6M, however this entails using the WSJT program which I find rather confusing. I'm interested in trying JT65A but I'm not sure if it is any more suitable than WSPR for this type of work. In the absence of any expert advice I'm going to try JT65A using a dial frequency of 50.276MHz. With the JT-Alert accessory to tell me when anyone replies I can leave the rig calling CQ whilst I am otherwise occupied. It will be interesting to see what we can work on 6m with the JT65A mode. Fast Doppler changes are usually due to reflections from meteors or aircraft. Yes, aircraft are a possibility at that distance. I have noticed the effect on 2m GB3VHF which is not receivable direct from this QTH due to being blocked by the mountains. I probably need to wait for better propagation to see the effect of Sporadic E on 6m signals. This page may be useful. You can actually identify which aircraft you are getting scattering from with practice. Hello Julian, I am using vertical polarization on 6m, might explain anomalous propagation - hope to have something horizontal up soon. Hi Julian, They look like aircraft scatter to me also. 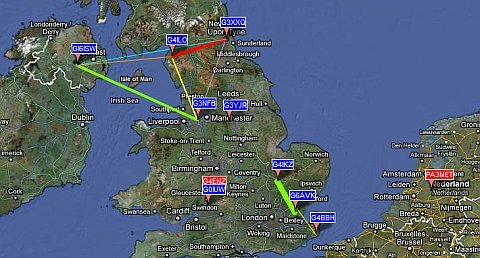 I have been monitoring the GB3VHF beacon and got some pings last night. I am in IO76GM so pretty damn good. I'd be happy to try some MS / or AS at some point with you. I'm only a little 100w 2 m station.